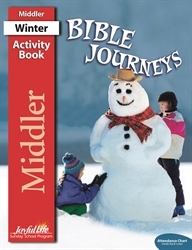 The individual weekly activity sheets help the children apply the Bible lesson to daily life. As children arrive each Sunday, they work on an activity sheet that either reviews last week’s lesson or prepares them for that day’s lesson. At the end of the lesson, the children do the back of the activity sheet, which reinforces today’s lesson. Occasionally, the activity sheet is a craft that the children begin before class and finish after the Bible lesson. The Activity Book also contains individual Attendance Charts (inside back cover) and Attendance Stickers (center insert) to be pulled out and kept separately. As each child arrives, he places the sticker on his Attendance Chart. The Attendance Charts may be hung on a bulletin board or used as wall decorations.